Business leaders are urging ministers to stick to plans for a metro transport system in south Wales and settle the row over rail electrification. The UK and Welsh governments each say the other should pay up to £500m to electrify the Valleys rail lines. 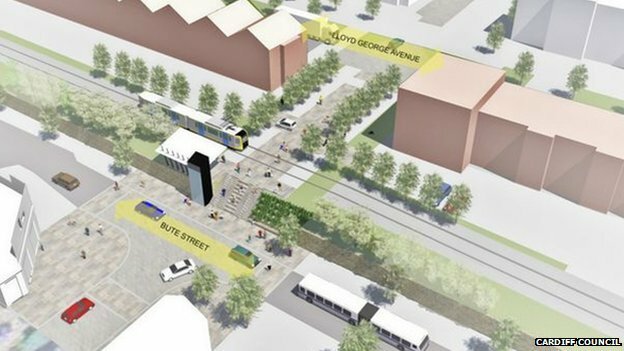 But rail industry expert Ian Walmsley has claimed a tram system connecting Cardiff with the Valleys would be cheaper and more effective. He suggests trams could cut journey times by 25% at 60% of the cost. Electrification is a key part of the metro project, which is aimed at improving transport links between Cardiff and the rest of south east Wales. The entire network, which could be built by 2030 and would involve trains, buses and trams, has been estimated as costing between £1bn and £4bn. More than 77,000 people commute into Cardiff each day with a large majority travelling by road, causing congestion. The metro is seen as a key project in making Cardiff a more attractive location for businesses, allowing people to continue living in their communities while being able to commute to work in the capital more easily. Mr Walmsley, a rail industry writer who worked on the development of the Valleys lines for British Rail in the 1980s, suggests trams would be cheaper and more effective than trains in the long run. According to his research, trams would reduce journey times by 25% at only 60% of the overall cost of replacing new heavy trains. The scheme may be more attractive in light of the ongoing dispute between the UK and Welsh governments over how the electrification of the Valleys lines will be funded. An outline business case for Valleys rail electrification - written by the Welsh government in 2012 - estimates the cost at between £309m and £463m. But concerns have been raised that electrificarion could be at risk if an agreement cannot be reached. There is some hope that the recent appointment of Stephen Crabb as Welsh Secretary could lead to the dispute being resolved. Chris Sutton, chair of CBI Wales, said: "It's a shame there has been this dispute on funding. "I note the Secretary of State said it was a 'knotty problem' which was top of his agenda so let's see whether something comes out of that. "The balance of those different modes of transport may well shift in the future but there is a plan there and let's really work on trying to deliver that at the moment." The Welsh government has said it will release a report on the metro shortly.